Our 5 day Kruger Park Safari Tours are perfect for those with limited time or budget. You can’t leave South Africa without at least going on a Safari in the Kruger National Park. 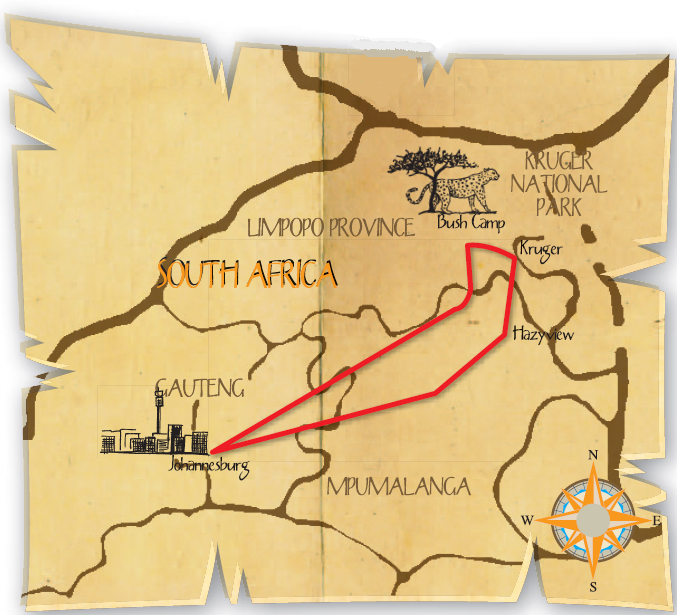 This tour conveniently starts and ends in Johannesburg. We head out East to the Kruger National Park for all the safaris during these tours, and our guides will do their best to find as many wild animals as possible for you. If you are lucky, you might even see the BIG 5- lion, leopard, elephant, rhino and buffalo. Included highlights: Bush walks, open vehicle game drive (safari), private game reserve, the Kruger Park, the Panorama Route, exclusive bush lodge, Dullstroom, Blyde River Canyon, night game drive. Our Kruger Park Safari Tours start at 06:30 as we set off in the overland truck on the scenic road to the province of Mpumalanga. We will enjoy a brunch stop in the historic Dullstroom before we wind our way down the Drakensberg escarpment and into the untamed Lowveld. The next two nights will be spent at our well-appointed bush lodge, which is situated in a private reserve within the greater Kruger National Park, an area where animals roam naturally and unrestricted. The tented Lodge blends into the bush and offers comfortable beds, en-suite bathrooms, a refreshing splash pool, and stunning views over the surrounding wilderness. Dinner tonight will be prepared in the traditional way over an open fire. As is custom in the bush, we start the day with coffee and rusks before embarking on a game walk (safari on foot). Although we will walk around for about three hours, the purpose is not to cover distance but rather to search for animals and in so doing, to learn more about the ways of the bush. Your guide and/ or a tracker will lead all walks. Before the heat of the day, we return to the lodge for a sumptuous brunch after which it’s time to relax around the lodge and to enjoy the serenity of the surrounding wilderness. In the afternoon we conduct an open vehicle game drive (safari) which develops into an extensive night drive all the time searching for animals. Being in the bush at night provides us with the opportunity of viewing nocturnal animals. This evening we enjoy a hearty bush braai (BBQ) cooked on an open fire. Fall asleep to the sounds of the wild. Rising with the African sun, we will enjoy a hearty breakfast before setting off to explore the highlights of the Panorama Route. Our first stop will be to view the impressive Blyde River Canyon, then on to Bourke’s Luck Potholes, Gods Window, and the cosy little town of Graskop where we will enjoy a lunch at Harry’s Pancake Bar (own expense). This afternoon we descend the Kowyns Pass and after a full day, we make our way to the lodge in Hazyview - a log cabin built spectacularly on stilts in the indigenous forest on the banks of the Sabie River. We will stay here for two nights. After an early start again, we depart at sunrise and travel the short distance to enter the southern sector of the Kruger National Park for a full day of safari. Slowly traversing in search of the many animals that inhabit this area, we enjoy the high vantage point and comfort of our well-equipped vehicle. Our guide will take time to explain the behaviour of the animals we see in this fascinating environment. Although most of the day will be spent game viewing (safari), we will stop at various designated sites to stretch our legs, to enjoy brunch, and to wander around one of the Parks rest camps. We exit the Park late in the afternoon and return to the comfort of our lodge in Hazyview. After a relaxed morning at the lodge in Hazyview, we depart and arrive back in Johannesburg in the late afternoon where your tour comes to an end.